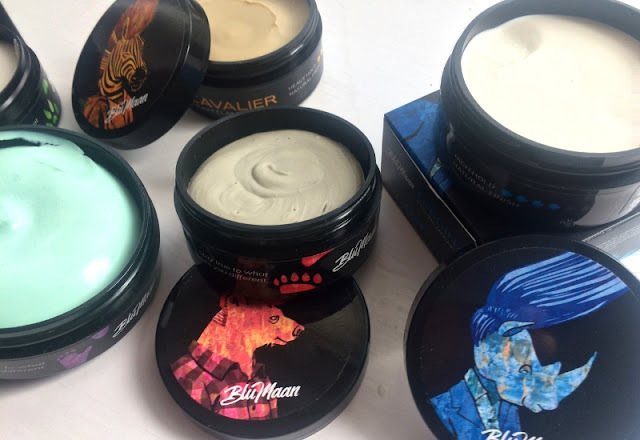 Hair styling solutions for men: The BluMaan hairstyling range consists of five hair products designed to cater for every hair type. We've been through a fair few styling product ranges here at The Male Grooming Review, some good, and others not so good, but it's been a while since we got our hands on a really decent range that rises head and shoulders above the pack. 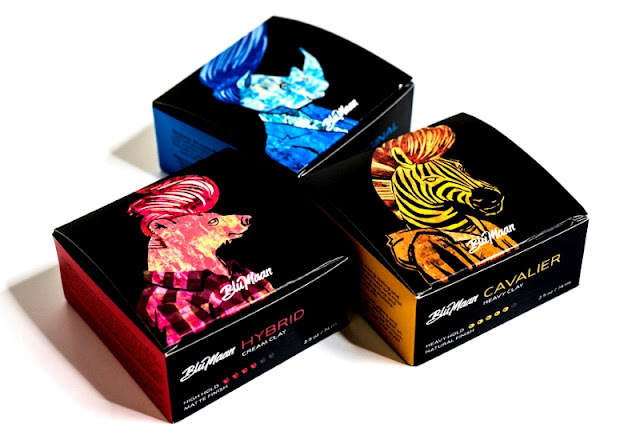 The new look BluMaan hairstyling range certainly stands out from the pack, on appearance alone, and I'd say the branding for this range is one of the strongest out there. I'm looking at five neatly boxed hairstyling products, contained in black pots with colourful and vibrant themes. We've got a matte paste, a styling meraki, a heavy clay, a cream clay, and a mightily impressive styling mask pomade. I have to say, the illustrations on each box are pretty cool. Each box is colour-coded with its own animal on it, each sporting a funky hairstyle. It's nothing our of the ordinary, but it's cool, and I like it. Let's start off with the Original Styling Meraki. Product description: The Blumaan Original Styling Meraki is an improved version of the very first product Original by BluMaan. This new formulation allows for a creamier application while having all the awesome benefits of the first version. 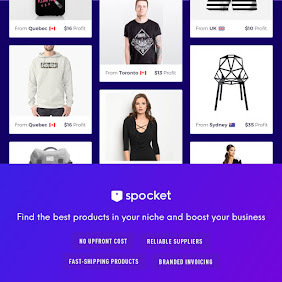 This unique community-designed product has pre and post styling capabilities and is made with you in mind. First impressions: I instantly knew this was my kinda hair style product as soon as I opened the pot. The meraki texture is not too thick, but I wouldn't describe it as soft either. It moulds nicely into your finger upon rubbing, and glides through the hair with ease. My thoughts: This is the sort of texture where a little can go a long way. It's a great product for sculpting the hair, without the risk of making your strands look greasy and flat. If you've got short to medium length hair which is quite full in thickness, then this product would be something for you to try. Rating: Again, this is a very impressive product, and something that I would definitely buy and use on my hair regularly. The mint scent also adds a fresh element to the product. I'd give this a rating of 8/10. 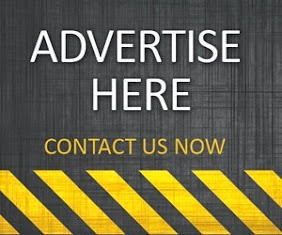 Product description: This product works with your hair to create extreme texture that will turn heads. From the classic to the creative, you can count on Cavalier Heavy Clay’s strong hold to make your hairstyle last all day. Still not convinced? Well, the Cavalier Heavy Clay also nourishes and strengthens your hair with organic oils, natural proteins and amino acids. First impressions: I should start off by saying that the Cavalier Heavy Clay is not the type of product I would ever consider using on my hair. But that's not to say it isn't any good. What works for one person's hair doesn't necessarily work for the next person. This texture is far too thick and sticky for my hair type. It reminds me of the harsh Dax Wax product, but not quite as strong. My thoughts: Again, it is very unlikely I would use this product, but I can see its appeal for men who have very short hair. I usually wear my hair medium length, which goes against the purpose of this product. Still, the scent is nice, which I can only describe as a very soft caramel. Rating: As a heavy textured styling product, this is a good clay. It gives a natural finish, and is actually very easy to wash out. I'd give it a respectable 7/10. Product description: Each jar of Hybrid Cream Clay is carefully hand-crafted in collaboration with Arcadian Grooming. BluMaan is committed to creating unique products, and this fusion of cream and clay utilizes the best aspects of each. Hybrid’s creamy texture provides a smooth, comfortable application and the clay leaves the hair with a natural matte finish. After 10-15 minutes, the product will “activate” to a light-medium hold, allowing you ample time to style! This product works great for those who want to achieve relaxed, messy styles. Hybrid also contains nourishing ingredients that enrich the follicles with nutrients and fatty acids which promote hair health and growth. First impressions: The Hybrid Cream Clay was up next, and the first thing I really liked about this product was its scent. It's a very minimal, natural scent, which is great, because overpowering scents can ruin the hair styling experience - especially if you are mixing smells from your deodorants and colognes. My thoughts: I have tried these medium hold clays before, and I don't usually get on with them, but this one isn't too bad at all. In fact, I quite liked it. However, after application, it did make my hair look a little wet, and the hold wasn't strong enough to last the whole day. For some guys, that wet look works, and it is ultimately want they want, but for me personally, I prefer my hair to look full and dry. Rating: I always try and judge a product on its overall quality, and not on my own preferences. This is a good clay that services its purpose well. It gets a 7/10 from me. Product description: A matte paste that offers ultra weightless control with a medium-high intensifying hold. Creating and defining texture has never been easier with Monarch Matte Paste. Its extreme smooth application gives you the control you need with zero tug or pull, allowing you to re-style your hair throughout the day. A versatile product for any style - Quiff or Slick Back. First impressions: Well, what can I say about the Monarch Matte Paste? Now we're talking! I absolute love this kind of hairstyling product - that high hold, medium to thick texture, subtle scent, and long lasting hold. I whacked this stuff on my locks in the morning, and I had that same, dry looking hold by the evening. My thoughts: This would be my main hairstyling product, so I would use this paste daily. After showering and blow-drying, I'd apply this paste to my hair, and let it work its magic. Rating: The Monarch Matte Paste ticks all the boxes for me. It just works for me on so many levels - it's exactly what my hair type needs and loves. Call me bias, but this gets a 10/10 from me. 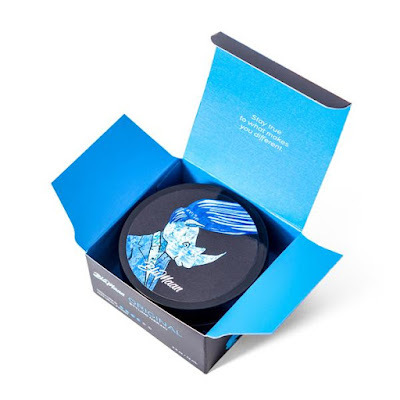 Product description: BluMaan's Fifth Sample Styling Mask Pomade (Low Shine Edition) has been reformulated to maintain the core features of its original edition with some attractive upgrades. 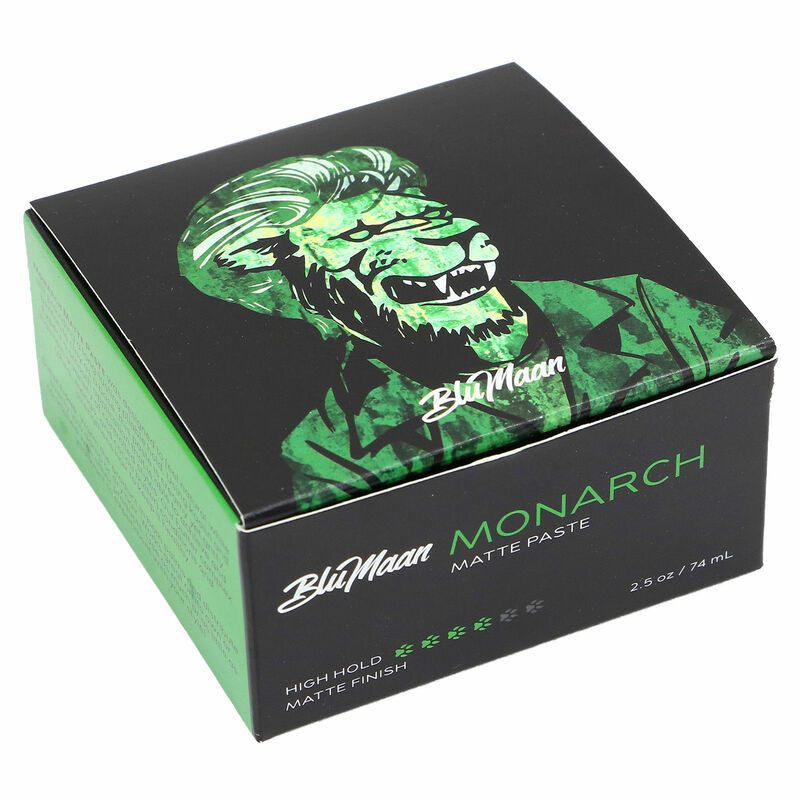 This product took over three years to develop together with a team of pomade experts. Fifth Sample features a long-lasting hold, incredible washability, and a re-defined formula that is easy to break down. We increased the concentration of nutrients to keep your hair healthier after every wash! First impressions: Last, and certainly not least, is the Fifth Sample Styling Mask Pomade. Now, when I think of pomades, I usually think Elvis, 1950s etc. I've never been one to delve into the world of pomades, simply because I didn't think they'd be my kinda thing. 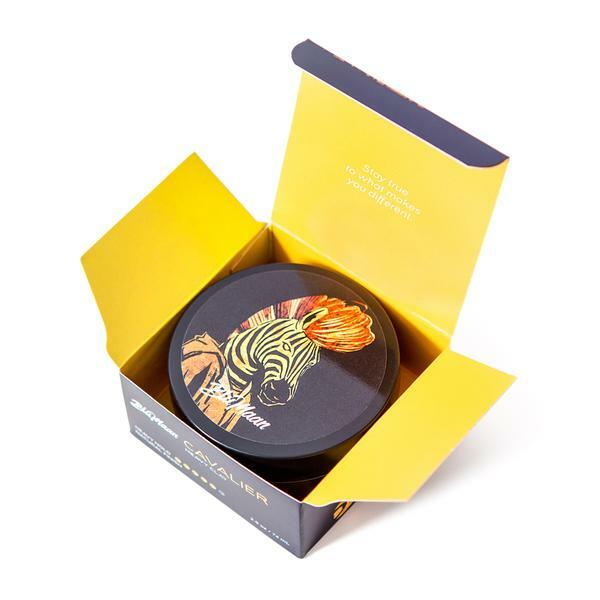 When I first opened the pot to this pomade, my first reaction was "errr, this definitely isn't for me", but once I dipped my finger in it, I quickly realised it had a much softer texture than I thought. My thoughts: The more I fiddle with this pomade and run it through my strands, the more I like it. It's kind of similar to the Hybrid Cream Clay, but not as creamy in texture. I prefer this one because it glides into the hair well, and it doesn't leave the strands looking wet and greasy. 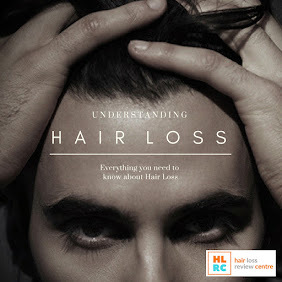 It works for many hair types and lengths, making it possible the most versatile product of the range. Rating: This pomade was a nice surprise for me. Nicely textured, giving a natural looking hold, all topped off with a nice zesty, mint scent. I'd give it a 9/10. 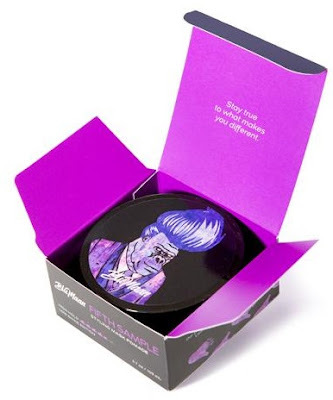 Take your hair to another level of styling, with the BluMaan range.